Review: Melvin Udall is a compulsive-obsessive and a homophobic romance novelist. He is compelled to get to know his neighbour and also a waitress who puts up with Melvin’s abuse over breakfast everyday. Actors: Jack Nicholson, Helen Hunt, Greg Kinnear and Cuba Gooding Jr. 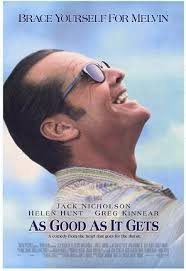 The performances are brilliant especially from Jack Nicholson and Helen Hunt. This film was a box office hit, opening at number three at the box office (behind Titanic and Tomorrow Never Dies) with $12.6 million, and eventually earning over $148 million domestically and $314 million worldwide. John Cusack considered the role of Simon Bishop but pulled out. The role of Carol Connolly was initially offered to Holly Hunter. After this film Helen Hunt took a two year gap. She had been working almost continuously since she was 9 years old. Originally this film was called “”Old Friends”. It was composer Hans Zimmer who suggested changing the title. Just two of the themes are loneliness and also despair. At the Academy Award in 1998 this won 2 Oscars. They were for Best Actor in a Leading Role (Jack Nicholson) and Best Actress in a Leading Role (Helen Hunt). At the Golden Globe Awards in 1998 this won three awards. They were for Best Performance by an Actress in a Motion Picture – Comedy or Musical (Helen Hunt), Best Performance by an Actor in a Motion Picture – Comedy or Musical (Jack Nicholson) and also Best Motion Picture – Comedy or Musical. One film critic said about this film “It’s a mark of how magically written, directed, and acted As Good as It Gets is that we end up loving this film despite knowing how haphazard, scattershot and almost indefinable its charm is”.